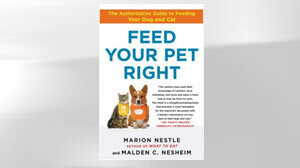 The book "Feed Your Pet Right" by Marion Nestle and Malden C. Nesheim is shown. Marion Nestle, a human nutrition expert, is the author of three prize-winning books about human food issues, including "What to Eat." Nestle has a doctorate in molecular biology and a master's degree in public nutrition. Malden C. Nesheim is an animal nutrition expert and co-author of "Nutrition of the Chicken." He is provost emeritus and professor of nutrition emeritus at Cornell University, and he has a doctorate in nutrition and a master's degree in animal nutrition. "Feed Your Pet Right: The Authoritative Guide to Feeding Your Dog or Cat," is a research-based guide on the best way to feed pets. The book includes an in-depth analysis of the pet food industry. Check out an excerpt of the book below, then head to the "GMA" Library for other great reads. In this book, we provide dog and cat owners with the information they need to know about what their pets eat and why. We are professors in the human nutrition departments at New York University (Marion Nestle) and Cornell University (Malden Nesheim). Both of us have had long careers in human nutrition and Malden Nesheim received much of his early training and experience in animal nutrition. But how we came to write a book about pet food and feeding is a story best told by Marion Nestle because Feed Your Pet Right evolved from What to Eat, a book she wrote in 2006 about food for people. What to Eat is not really a how-to book; it is a book about how to think about what to eat. * This book discusses food for dogs and cats. It does not cover food for birds, fish, reptiles, or amphibians. Even though nearly 400 million of such creatures are kept as pets, their food accounts for less than 5 percent of the U.S. pet food market. Similarly, Feed Your Pet Right is about how to decide for yourself what's best for your pet to eat and how to feel more confident about your choices. For much of 2005 and 2006, I was spending every minute I could in supermarkets researching the topics I wrote about in What to Eat. That book, which started out as a guide to supermarkets, ended up as a reference work on the enormous range of issues—from basic nutrition to international politics -- that confront anyone faced with food choices these days. As I wandered through supermarket aisles, I kept running across pet foods. In some stores, they occupied entire aisles, six shelves high. By the time I began paying attention to these products in a more serious way, I knew that food companies paid "slotting" fees (bribes, for all practical purposes) to many supermarkets for every inch of prime retail shelf space. It seemed obvious that pet foods must be a lively and profitable business for all concerned. When I looked at the cans, pouches, and bags on those shelves, I was surprised by their labels. The Food and Drug Administration (FDA) has strict rules for what can and cannot go on the labels of foods for humans, but for historical reasons (which we explain later on) it regulates pet foods in an entirely different manner -- as animal feed. The FDA requires the labels on feed for farm animals to list ingredients, but does not officially permit statements about benefits for special health conditions. Yet here were foods marketed for dogs and cats bearing claims that ingredients in the products could help reduce the risk of heart disease or diabetes, stimulate immune function, treat skin or joint disorders, or alleviate the infirmities of aging. The shelves were full of products advertised for dogs of different sizes and breeds, for puppies and kittens, for cats kept indoors, and for those fed vegetarian or all-meat diets. If for no other reason than to satisfy curiosity, I thought it would be a good idea to add a chapter to What to Eat about pet food choices. But by that time, the manuscript had expanded to more than six hundred pages and I was eager (desperate is more like it) to bring it to a close. Even though I suspected that pet owners were just as curious as I was, and just as interested in reliable information about what to feed their cats and dogs, I reluctantly abandoned the idea of including that chapter. As soon as the book appeared, it was obvious that I had missed an opportunity. When giving talks about What to Eat, I began to hear about what I now think of as "the pet food gap." People asked, "Why can't you do the same for pet food? I don't have a clue what to feed my dog." "My cat will only eat this one brand and she hisses if I try anything else. How do I know if what I am feeding her is okay?" and "My veterinarian says one thing but books say another -- and they say opposite things. Whose information should I trust?" * We are well aware of concerns about the meaning of "owner" as applied to companion animals, and we struggled with how best to term the relationship. To us, ownership implies (or should imply) guardianship and stewardship. For simplicity, we use that term throughout this book. From such questions, it was obvious that the matter of what to feed pets was just as important and just as confusing to owners as what to feed themselves and their families. Indeed, as I soon discovered, the question of what to feed pets can be far more important to people than what they feed themselves. If you have a pet, you are likely to adore your animal. You love pleasing your pet and food is an easy and satisfying way to express your love. You and other pet owners want to feed your animals properly, but the pet food marketplace is just as complicated, misleading, and confusing as the human food marketplace -- and sometimes more so. I thought it would be interesting and useful to answer such questions and to help clarify some of the choices involved in pet feeding and I convinced Malden Nesheim to join me in this project. The subsequent "we" represents both of us and reflects our joint perspective on the issues we cover in this book. As we quickly learned, our particular perspective is unusual in this field. We approached this project out of genuine curiosity, with few preconceptions about what we might learn and without any specific goals in mind. Neither of us had any ties to the pet food industry, and we still do not. This book is the result of our attempt to bring as much objectivity as we could to examination of the pet food issues we discuss here. Marion Nestle is a city girl. She was born in New York City, grew up in Los Angeles, but returned to Manhattan in 1988 and has been there ever since. She earned a doctorate in molecular biology and a master's in public health nutrition from the University of California at Berkeley, and has held jobs teaching and writing about human nutrition for more than thirty years at Brandeis University, the University of California School of Medicine in San Francisco, and, since 1988, at New York University. Her farm experience began in a childhood summer camp in Vermont where she took care of a dozen free-range Rhode Island Reds, but is otherwise limited to occasional farm visits. While working on this book, she was a member of the Pew Commission on Industrial Farm Animal Production, which released its final report in 2008. She is the author of three prize-winning books about human food issues: Food Politics: How the Food Industry Influences Nutrition and Health (2002, revised edition 2007), Safe Food: The Politics of Food Safety (2003, revised edition 2010), and What to Eat (2006). Her book on the pet food recalls of 2007, Pet Food Politics: The Chihuahua in the Coal Mine, was published in 2008. Malden Nesheim started off in life as a farm boy. He was one of eight children growing up on an Illinois farm that kept cows, steers, sheep, pigs, horses, and chickens, and supported any number of working cats and dogs. He majored in agricultural science at the University of Illinois (Champaign-Urbana), and holds master's and doctoral degrees in animal nutrition. For many years, he was a professor of animal nutrition at Cornell University, followed by many more years as director of Cornell's Division of Nutritional Sciences, its vice president for budget and planning, and provost. He is a coauthor of Nutrition of the Chicken (1982), the definitive book on this subject, and Poultry Production (10th to 13th editions) as well as many articles in professional journals on various aspects of animal and human nutrition. He is a recipient of an award from the American Feed Manufacturers Association for research in animal nutrition, and is a past president of the American Institute of Nutrition. He is now professor emeritus, but continues to be active in the Division of Nutritional Sciences at Cornell. As you can see from these biographies, both of us have long careers in academic research. We approached this project as we would any other such project: we or our assistants went to libraries, read books and journals, and consulted Internet websites. We subscribed to Petfood Industry and other trade journals. Beyond that, we tried to obtain as much firsthand experience as the pet food industry would allow. We visited stores selling pet foods, bought products, collected their labels, and donated the foods to our local SPCA shelters. When permitted, we went to meetings of pet food and ingredient suppliers, and of animal scientists giving presentations on their research. We talked to pet owners but also to the owners of pet food companies and stores, ingredient manufacturers, and animal scientists. We visited every manufacturing plant that would let us in and spoke with their owners and managers. We toured veterinary clinics and hospitals. We talked to veterinary students, representatives of veterinary colleges, and practicing veterinarians. makes pet foods is unusually closed and secretive. We were refused many requests to visit and hardly any industry representatives agreed to talk to us on the record. We greatly appreciated the generosity of the companies that did open their doors to us and the many individuals who freely provided us with introductions, explanations, and information, and we acknowledge their contributions at the end of this book. When we told friends and colleagues we were writing a book about foods for cats and dogs, we heard two kinds of reactions. Pet lovers told us: "Oh good. Get it done fast. We need this book." Others, however, gave us puzzled looks or expressed dismay that we would waste time on anything so unimportant to society as companion animals. As they put the matter: "With so many children in the world starving or without health care, it's appalling that people spend so much money on pets." One colleague sarcastically suggested that a better title for the book would be Eat Your Pet (we think she was joking, but we do discuss such issues in chapter 23). Late in 2006, we did not have easy responses to such comments, but we had a hunch that there was more to the pet food story than seemed obvious. And then, in March 2007, Menu Foods, a manufacturer of "wet" (canned and pouched) pet foods based in Canada, announced that a few cats that had eaten its foods had become sick or died from kidney blockage. The company would be recalling 60 million cans and pouches of nearly one hundred different brands of pet foods. Suddenly, we no longer had to justify our interest in writing about pet foods. It was immediately obvious that pet foods were the proverbial canary (we prefer Chihuahua) in the coal mine. Pet foods displayed early warning signs of massive safety problems in the worldwide production and distribution of many other consumer products ranging from toothpaste to prescription drugs and, later, to Chinese infant formulas and American peanut butter. The recall exposed previously hidden links between pet foods and the human food supply. Pet foods could no longer be considered as a tiny but profitable niche market. Instead, it was evident that pet foods are part of a global network for producing food for people and for farm animals, as well as for cats and dogs. We all share one interconnected food supply. This means that anyone who cares about the safety and quality of food for people, pets, or other animals also needs to care about how pet foods are made, used, and monitored. Indeed, the implications of the recall are so profound that one of us (Nestle) ended up telling its story in a separate book, Pet Food Politics: The Chihuahua in the Coal Mine (University of California Press, 2008). Let's begin by visiting the pet food aisle of a good-sized supermarket. In the summer of 2008, for example, the Wegmans supermarket in Ithaca, New York, devoted both sides of an entire 120-foot aisle to pet foods and products. We estimated that this took up 13 percent of the store's centeraisle space, roughly the same proportion devoted to sodas. The shelves rose six feet above the floor, and each was packed with cans, pouches, and bags of foods, treats, and chews in sizes ranging from three-ounce cans of cat food to forty-pound bags of dog kibble. We counted out the number of four-foot sections, multiplied them by the number of shelves, and came up with 328 linear feet of shelf space devoted to cat foods, and 395 feet to dog foods -- more than 700 linear feet of supermarket real estate devoted to these products. As is true of most pet food aisles, dog food takes up more space than cat food. Although Americans own many more cats than dogs -- 94 million compared to 78 million -- dogs eat more than cats, and owners tend to spend more money on food and treats for them. At the time, Wegmans carried several leading brands produced by major pet food companies, along with its own favorably priced, private-label Bruiser dog food and Buju & Ziggie cat food brands. Choosing from any such array of products is a daunting task. Price is only one of many considerations. Manufacturers design pet foods for a large number of particular purposes, each aimed at a particular market segment. The most important distinction is between complete-and-balanced foods and snacks or treats. Commercial pet foods share much in common with infant formulas. They provide complete nutrition in one convenient package. If you follow the feeding directions, the food takes care of your pet's requirements for calories and all essential nutrients. In contrast, snacks and treats have some nutritional value but are incomplete and need to be supplemented with foods that contain all of the nutrients required by a cat or dog. Within the complete-and-balanced category, you can select from among foods that differ in form or price; are targeted to an animal's stage of life, breed, or health condition; meet your expectations for ingredient quality; are consistent with your personal values about diet, nutrition, or the environment; or do or do not contain supplements aimed at relieving disease symptoms. We talk about each of these market segments in subsequent chapters. Complete-and-balanced pet foods are marketed as dry, semi-moist, or wet. Dry foods sell the best, which should be no surprise. They are relatively inexpensive and easy to store as they do not require refrigeration. Within each of these categories, companies offer products by brand.Within each brand, they offer variations in size, flavor, and other factors targeted to particular market segments. The size differences are obvious; the weights are listed on the packages. You can choose the one that is most convenient or least expensive. Flavors, however, are more complicated. A typical brand might come in beef, seafood, and poultry flavors, for example. Do the choices of form, flavor, and market segment make any difference to the health and happiness of a dog or cat -- or do they matter most to its owner? That is what this book is about. Along with our discussion of the various products, we give our candid opinions of the value of their ingredients and the issues raised by the way they are marketed. We also give you the information you need to form your own opinions about the products and their marketing, and how much these issues matter in deciding what and how much to feed your cat or dog. We invite you to join us on this journey, and hope that you find it as interesting, entertaining, and useful as we did.